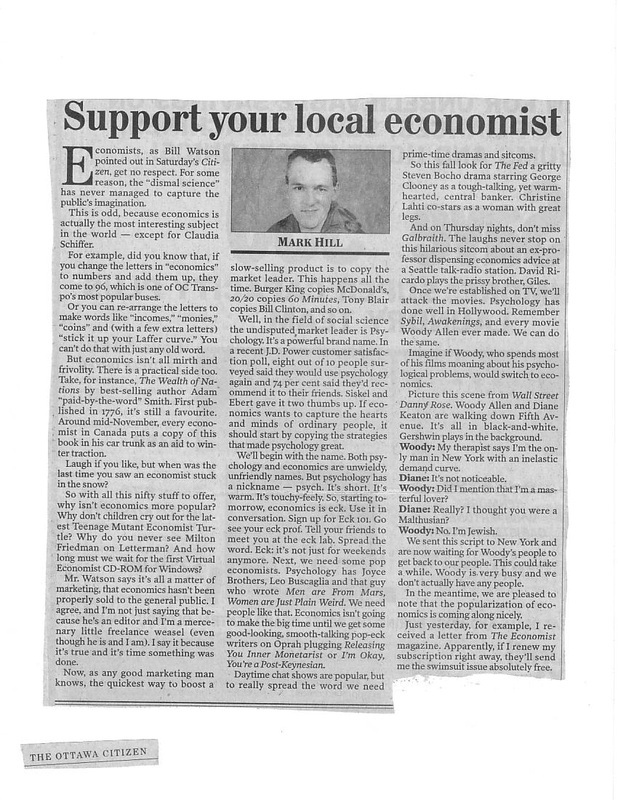 Economists, as Bill Watson pointed out in Saturday's Citizen, get no respect. For some reason, the "dismal science" has never managed to capture the public's imagination. This is odd, because economics is actually the most interesting subject in the world — except for Claudia Schiffer. For example, did you know that if you change the letters in "economics" to numbers and add them up, they come to 96, which is one of OC Transpo's most popular buses. arrange the letters to make words like "incomes," monies," "coins" and (with a few extra letters) "stick it up your Laffer curve." You can't do that with just any old word. But economics isn't all mirth and frivolity. There is a practical side, too. -November, every economist in Canada puts a copy of this book in his car trunk as an aid to winter traction. Laugh if you like, but when was the last time you saw an economist stuck in the snow? Mr. Watson says it's all a matter of marketing, that economics hasn't been properly sold to the general public. I agree, and I'm not just saying that because he's an editor and I'm a mercenary little freelance weasel (even though, he is and l am). I say it because it's true and it's time something was done. selling product is to copy the market leader. This happens all the time. Burger King copies McDonald's; 20/20 copies 60 Minutes; Tony Blair copies Bill Clinton, and so on. Well, in the field of social science the undisputed market leader is Psychology. It's a powerful brand name. In a recent, J.D. Power customer satisfaction poll, eight out of ten people surveyed said they would use psychology again and 74 per cent said they'd recommend it to their friends. Siskel and Ebert gave it two thumbs up. If economics wants to capture the hearts and minds of ordinary people, it should start by copying the strategies that made psychology great. feely. 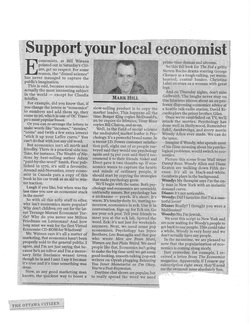 So starting tomorrow, economics is "eck." Use it in conversation. Sign up for Eck 101. Go see your eck prof. Tell friends to meet you at the eck lab. Spread the word. Eck: it's not just for weekends anymore. Daytime chat shows are popular, but to really spread the word we need prime-time dramas and sitcoms. -stars as a woman with great legs. radio station. David Ricardo plays the prissy brother, Giles. Once we're established on TV, we'll attack the movies. Psychology has done well in Hollywood. Remember Sybil, Awakenings, and every movie Woody Allen ever made. We can do the same. -white. Gershwin plays in the background. Woody: My therapist says I'm the only man in New York with an inelastic demand curve. Woody: Did I mention that I'm a masterful lover? Diane: Really? I thought you were a Malthusian? We sent this script to New York and are now waiting for Woody's people to get back to our people. This could take a while. Woody is very busy and we don't actually have any people. In the meantime, we are pleased to note that the popularization of economics is coming along nicely. Just yesterday, for example, I received a letter from The Economist magazine. Apparently, if I renew my subscription right away, they'll send me the swimsuit issue absolutely free.